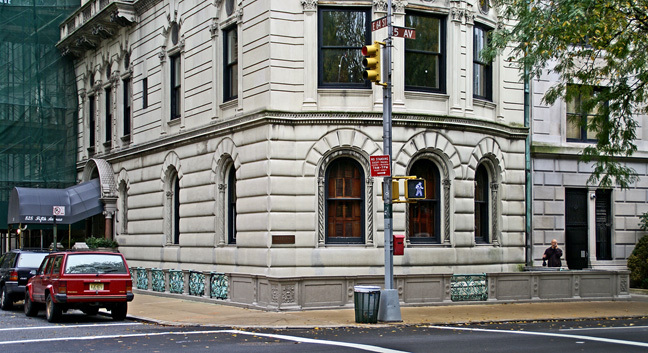 Not the grandest "Millionaire's Row" mansion extant, nonetheless this very robust building abounds with lively and fine detailing that makes it one of the most interesting on Fifth Avenue. 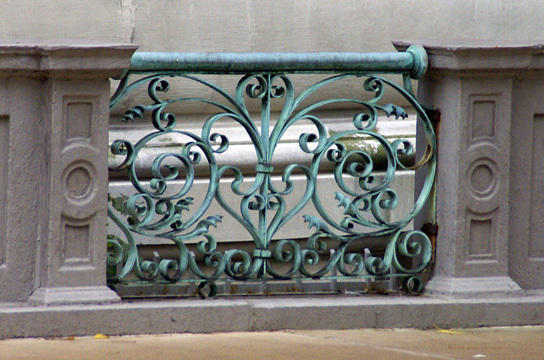 Whereas other millionaires opted for neo-Georgian, or neo-Classical, or Italian Renaissance-palazzo, or Beaux Arts confections, this building has one of the city's most elegant railings, a heavily rusticated limestone base with arched windows on the first floor, a less rusticated limestone second floor with an unusual and quite pronounced arched window overhang, a large bay on the lower three floors facing the avenue, an arched sidestreet entrance, and three floors of lovely deep red masonry with white window reveals with arched windows on the fourth floor and a fifth floor with considerably lower ceilings than the lower floors. To top it off, a modern glass penthouse was added in 1978 when the building was converted to condominium apartments. Its fenestration of the sidestreet facade is asymmetrical and the building has a nice "moat." It is a marvelously intriguing structure of great individuality that conveys a real sense of power, especially given its very prime location. It was constructed for Edward Berwind, a major owner of coal mines, and this was his "town house" and his country house was the legendary "Elms" in Newport, R. I. It was completed in 1896 and designed by Nathan Clark Mellen in a Victorian/Edwardian-like style and Horace Trumbauer added dormers in 1902. 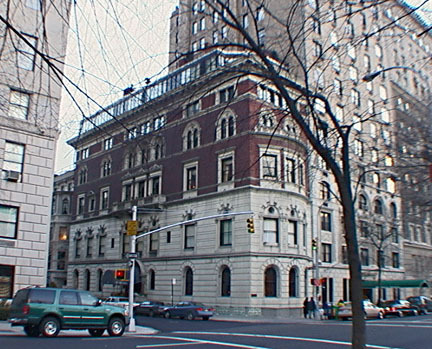 It eventually served as the headquarters of the Institute of Aeronautical Sciences. With its moat and rusticated limestone base, it projected a strong sense of security, but the deep red masonry of the upper floors and the energetic dynamism of the overall composition manifest a delightful urbanity. One almost expects young ladies with corsages to flit about the fourth floor balcony on the avenue or the third floor balcony on the sidestreet. Here, one felt, was the eccentric, rather than the decadent, rich.